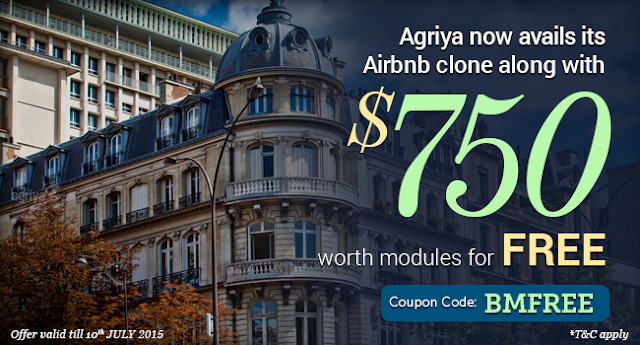 Agriya has yet again come out with a big bang offer for entrepreneurs who wish to launch a vacation rental website. The exclusive offer is for its impeccable Burrow script, a clone of Airbnb. Therefore, it is now a time for promising entrepreneurs to outperform in the vacation rental industry. Make no delay in using this golden chance to foray into the profitable vacation rental business, that too, within your budget. Alongside with this script, also get a $750 worth of modules at a free of cost. The modules are certain to boost your website performance drastically. Every single module brings with it the uniqueness and thereby helping you to increase the richness of your vacation rental website. Analyze your website performance for every single detail with the help of Google Analytics module. Increase your website loading speed with the high-performance module that is integrated with our Burrow script. Easily adds all the necessary payment options to your website from the SudoPay module that is integrated with 50 famous payment gateways. Earn extra amount of money apart from your regular income with the support of an excellent Affiliate module. A few additional modules which are crafted exclusively for your users are property request favorites, property request flag, collection management and property request. The limited time offer for its Burrow script is valid only for a few days starting from July 1, 2015. So hurry up and bag this offer before it ends on July 10, 2015. Once the offer period of Burrow expires, the original price will be restored. Such a wonderful offer like this may not knock at your door yet again. And, therefore, we invite you to avail this offer to start-up your vacation rental business much below the cost you estimate. Contact us right away in case of any queries with regard to this amazing offer. Our support team is always at your service.